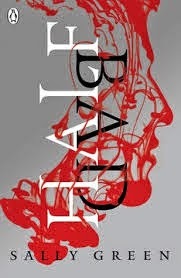 Half Bad is a young adult urban fantasy novel that seems to have been released amid an awful lot of hype. So much, in fact, that its release was marked at my nearest railway station by the author giving away copies accompanied by an actor in a cage playing her main character. The book also seems to have been marketed as a book with 'crossover appeal' that will be enjoyed as much by adults as its target audience of teenagers. Unfortunately, I don't think Half Bad either lives up to its hype or works particularly well as an adult read. The book is the first in a planned trilogy about Nathan Byrne, a young boy born into a family of White witches in present-day northern England. The complicating factor is that Nathan is the illegitimate son of a Black witch, and the White and Black witches despise each other to such an extent that the Black witches are tracked by 'Hunters' for imprisonment or execution. The ruling Council of White witches has decreed that all witches of mixed blood must be monitored and assigned as 'half-code' until they can be designated as Black or White when they reach adulthood. To complicate matters, Nathan's father isn't just any Black witch, but Marcus, apparently the most powerful and evil Black witch of all, prone to cannibalism and able to stop time. This makes Nathan not only despised by White witches, including his own half-sister Jessica, but also a valuable commodity as either a spy or a bargaining tool for the Council. Moreover, it's also essential that before he reaches the age of 17, Nathan must receive his three gifts in the traditional magical ceremony that all witches go through: if he doesn't, he will die. One of the main problems with all this is that none of it is anything like as exciting as it sounds. Nathan spends an awful lot of time brooding and moping and being sensitive and angst-ridden and tortured, but for what is supposedly an adventure, surprisingly little time actually taking action. At the start of the book he goes to school, where he can't cope because he can't read (despite this being a normal modern-day comprehensive school rather than some archaic magical establishment, nobody thinks to suggest that he might be dyslexic) and falls in love with a pretty blonde-haired girl called Annalise who doesn't have any discernible personality but is, naturally, a White witch whose brothers are intent on beating Nathan half to death. Nathan also spends a lot of time being taken for assessments by the Council, going on the run, and looking for various different people who are never as exciting as we hope they will be. Sometimes he's captured, and when he is, he escapes with implausible ease for more hiding and moping. I might have been able to deal with all this had Nathan himself not been such a teen-idol cliche of a character. Nathan is the archetypal misunderstood outsider, the brooding, hot-tempered bad boy who doesn't fit in. Essentially, Nathan, with his unique powers and his identity struggles and his apparent attractiveness to almost everyone of either gender who happens to meet him, is a teenage girl's wish fulfilment fantasy, and as such, is about as interesting to most adult reader as Twilight's Edward Cullen. There are times when Half Bad reads like fan-fiction of itself, particularly when Nathan decides to rebel against one of his captors by shaving his hair into a mohican and piercing his lip like some sort of suburban emo kid. Neither does subtlety seem to be Nathan's strong point, as he regularly cuts off his nose to spite his face by making smart remarks to the authorities at times when he'd clearly be far better off feigning compliance, apparently simply to show how cool and rebellious and individual he is. Despite this, he is, of course, a sweet and sensitive soul underneath who regularly talks of his profound love for his brother Arran in a way I can imagine no teenage boy ever doing. Half Bad leaves a lot of questions unresolved - if Nathan could potentially be so useful to the White witches, why do they treat him so appallingly rather than attempting to win him over, for instance? Why do the White and Black witches actually hate each other so much in the first place? - but as it's the first instalment of three I'm sure there's a reason why many things are left unexplained. It's made very clear that both sides are as bad each other and that the lines between good and evil are heavily blurred, and there's certainly plenty of potential for make this into an epic saga of a magical civil war, full of intrigue and in-fighting and interesting revelations from the past: I found the back-story in Half Bad far more interesting than the plot. Sadly, though, I simply can't care enough about Nathan, or any of the other characters, to make the effort to seek answers, and I won't be bothering with the rest of the trilogy.